For customers that need to carry out exposures to fumes/smoke generated by incineration of various materials, CH Technologies provides a versatile bench-top furnace. 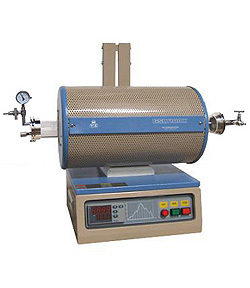 GSL-1100X is a CE certified small quartz tube furnace (2" diameter) designed for heating small samples up to 1100ºC. A built-in precision temperature controller can program up to 30 segments of heating, dwelling, and cooling steps. Both ends of the quartz tube are equipped with vacuum flanges offering appropriate fittings to connect to a system control unit on one side and an exposure chamber on the other. The furnace body is made of an adjustable height stainless steel shell with an energy saving high purity aluminum oxide fibrous insulation liner. The height of the body can be adjusted by three knobs on the back to flexibly change the furnace's vertical position within travel distance (from control box platform to lower end of the chamber). This flexibility allows for multiple configurations for various thermal processing needs. Combined with appropriately designed exhaust cooling and dilution regimen, this fume generator will provide a state-of-the-art, cost effective solution for generating test atmospheres from pyrolitic processes. The furnace can be set up in both vertical and horizontal positions to meet various applications such as heating sample, VLS, CVD, and quenching test. Set the furnace horizontally or at an angle to grow electronic crystals for semiconductor industry use or rotate it vertically for sintering applications.